Redefining the creative vista and driving MPC X and MPC Live in standalone and controller mode is AKAI Professional’s reimagined MPC Software 2.5; a cutting-edge production suite combining 128-track sequencing capability, real-time time stretching, clip-launch functionality, advanced MIDI editing capability, VST compatibility in controller mode, operation as a standalone application on Mac & PC, advanced sampling & audio editing/recording functionality, seamless DAW integration, a redesigned GUI and much more. Whether you’re seeking freedom from computer based music production, or searching for the perfect controller for DAW-centric creative exploration, MPC Software 2.5 grants the ultimate in adaptive creative versatility. AKAI Professional's MPC 2.5 is a major software/firmware update to the MPC 2 software application for both standalone and desktop versions. The new 2.5 update introduces a number of powerful production and performance features, most notably three virtual analogue plug-in instruments, the AIR TubeSynth, Bassline and Electric. 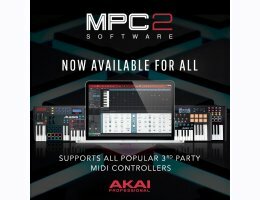 The 2.5 desktop software and firmware upgrade is available now as a free download at akaipro.com for all registered MPC Live and MPC X owners. TubeSynth emulates the sound of classic vintage analogue polysynths packaged with five integrated AIR effects, with all critical controls relayed in pristine detail via a custom GUI on MPC Live’s and MPC X’s radiant touch screen. Created by AIR Music Tech, TubeSynth is based on the same advanced analogue modelling technology found in their highly acclaimed desktop plugin synth Vacuum Pro, with a layout meticulously designed for maximum tweak-ability via the MPC Q-Links. The Tubesynth comes packaged with a comprehensive factory library of cutting edge presets including sumptuous pads, hard-hitting plucks, thunderous basses and screaming lead sounds. The AIR Bassline emulates the sound of classic mono synths with a contemporary twist. Including four integrated AIR effects as well as two built-in distortion algorithms. The AIR Electric emulates the sound of classic electric pianos. Dedicated Pickup, Envelope, Bell and Noise parameter sections provide a huge amount of flexibility to configure the timbre of the electric piano sound. Five AIR effects Tremolo, Tube distortion, Chorus, Delay and Spring Reverb. And, Over 80 presets. Please see respective product pages for plug-ins, for their system requirements.